The Korean Representative to Palestine, H.E. 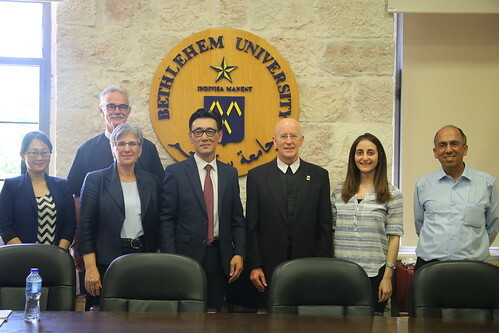 Young-sam Choi, and a delegation from the Representative’s Office visited Bethlehem University on Monday, 21 May 2018. Brother Peter Bray, Vice Chancellor, Brother Denis Loft, Vice President for Advancement, Dr. Irene Hazou, Academic Vice President, and Dr. Mazin Qumsieh, Director of Palestine Museum of Natural History, welcomed the delegation on campus. The visit aimed at discussing existing cooperation between the Korean Representative Office and the University and looking into expanding the student and faculty exchange programs. Brother Peter explained that the development plan of the University includes the new building for the Faculty of Nursing project which has just begun. H.E. Choi was impressed by the work of the University and particularly the new nursing project.